The California Chamber of Commerce launched a legal torpedo at the state’s new carbon trading market, set to begin Wednesday. The group, which represents 13,000 businesses in the state, is asking the Sacramento Superior Court to invalidate the state’s first official auction of permits for large emitters of greenhouse gases. The suit challenges the California Air Resources Board's authority under the state's 2006 climate-change law, AB 32, to sell the permits, called "allowances," for the purpose of generating revenue for the state. "It’s not about AB 32, it’s not about cap-and-trade, it’s not about climate science. It’s about the revenue-raising auction. We think it’s illegal. We think that in the fullness of time, a judge is going to agree with us. We want AB 32 implemented cost-effectively like the law," said Loren Kaye, president of California Foundation for Commerce and Education, a think tank associated with the Chamber. The group was not seeking an injunction to halt the program immediately, said Kaye. The cap-and-trade plan places a limit, or cap, on emissions from individual polluters. Businesses are required to cut emissions to cap levels or buy allowances from other companies for each ton over the cap that is discharged annually. If a business were to cut emissions below the cap, it could profit by selling its extra allowances. The first auction is being closely watched. It will mark the start of the most comprehensive carbon trading program in American history. For the first two years of the program, large industrial emitters will receive 90 percent of their allowances for free in a soft start meant to give companies time to reduce emissions through new technologies or other means. The cap, or number of allowances, will decline over time in an effort to drastically reduce greenhouse gas emissions by 2050. Officials at the Air Board say say they’re reviewing the lawsuit and will go ahead with tomorrow’s auction. The cap-and-trade program covers 360 businesses in California, from oil refineries to food processors. "This market-based approach to cutting greenhouse emissions gives businesses the flexibility to best decide how to reduce their emissions. We are going forward with tomorrow's auction," said Board spokesman Stanley Young. The Air Board estimates that about $1 billion could be raised from the sale of allowances in fiscal year 2012-13. About 23 million allowances will be sold for 2013 emissions, and 39.5 million allowances are being pre-sold Wednesday for 2015 emissions. There is some uncertainty about how, exactly, the money will be used. But California law dictates that it go into a greenhouse gas reduction account, and any programs that use the funds be consistent with the goals of the state's climate change law. 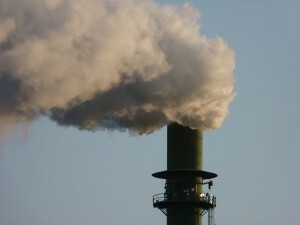 California officials hope a successful rollout of its cap-and-trade system will embolden other states to follow suit. Currently, a much less inclusive cap-and-trade scheme that covers only electricity producers is in effect for northeastern states. But the chamber argues that California's system goes too far. "Unless we adopt the most cost effective way of reducing carbon emissions, other states will not follow us," Allan Zaremberg, the chamber's president and CEO, said in a statement. "The current ... proposal is the most costly way to implement AB32, and it will hurt consumers, the job climate, and the ability of businesses to expand here." Where Do California's Carbon Emissions Come From?